If you love gardening or have always wanted to start, you will love this collection. 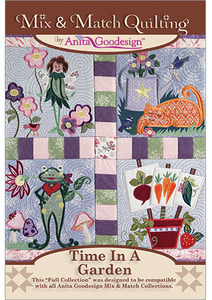 Time in a Garden brings your beautiful garden to life on a quilt or pillow. The collection has garden fairies, gnomes, cats, bees, and of course flowers. The designs are mostly applique so you can feature your favorite fabric. We simply used a fat-quarter bundle to choose our colors. We also include a few different border blocks that you can use to add to your quilt. These designs look great any way you use them. For example one design makes a great potholder. Six of the C size designs make a great place mat and of course 4 large blocks can create a beautiful pillow.